As a teacher, I get to talk – alot. I get to fill a whole hour. I don’t have to ask a single question. I can just talk, and they have to sit there and follow along. It’s kinda nice. It’s a little addicting. I love it when I get to listen though. 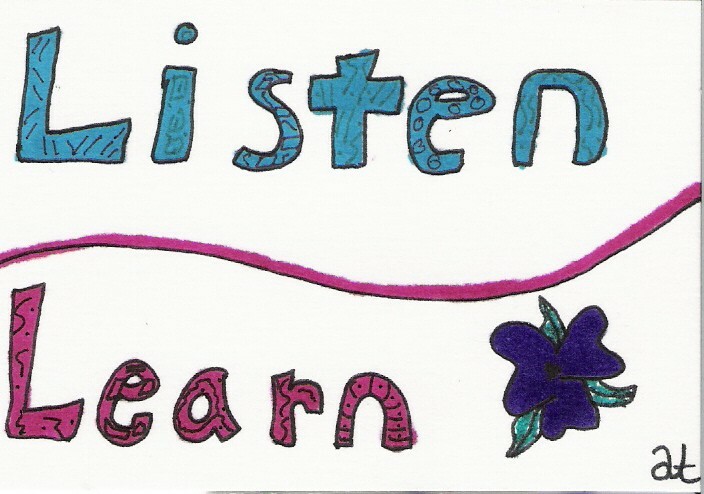 I can learn more when I listen. I love being in conversations where I get to just sit and listen. It’s not just listening to what’s being said. It also includes listening to what’s not being said. That’s a much harder skill to learn – something that I am learning. Listen to what is said – then listen to everything else. You’ll learn more. I will try to listen to what is not being said. The roots go deeper than what we can see on the outside. Try listening to what is not said – and at the same time – listen to what you are saying in your mind and heart – while you listen. We subconsciously do that. Thanks for reading A. Lan. Ah, deep listening. A skill always needing more rehearsal. Perhaps this is one lesson the Desert Fathers learnt, to let go of need to talk at first impulse. Enjoy your posts Lem. Take care. Thanks for reading. What do you know of the desert fathers? Who have you read and what practices do you use? How interesting. Can we talk about this more? There are the Apophthegmata Patrum. Have also read some of Saint Teresa D’Avila and Thomas a Kempis. The latter two are not considered of the school of the Desert Fathers and Mothers. This is writing/practice of early Christian spirituality/mysticism. I think we can bloom in the desert we inhabit. I learnt a little bit living in the wilderness of ‘illness’. There are lessons in silence, as discussed in many traditions (e.g. Buddhist meditation). I pray in a variety of ways solo and with others, in words, silence, meditation on text, song, walking to appreciate the wonder of the natural world. I learn awareness of the discipline my old people said that eventually we want to make everything a prayer. From previous, I have no podcast. I also have an oddness of speech due to illness but can write. I am glad you got United Nations of B reference. Yes expensive but quality clothing. I think there was at a time a desire to be one world culture but I see more a return to balkanization – culture wars (Banks). The Tower of Babel, perhaps? Hoping UR well. Take care.